For medical reasons, I really shouldn't become dehydrated. I hate the taste of water and find it impossible to drink as much as necessary. What should I be drinking instead? Terms and conditions under the cut. I use Wyler's Light Sugar-Free Lemonade Mix for this purpose. It basically produces water that tastes like strong lemonade. What fruit flavors do you like, and what are your preferences on artificial sweeteners? Sodastreams and their accompanying flavors make tasty drinks really easy to always have on hand. And the bottle you use is a 1L bottle; I imagine that would make it easy to track your consumption. I drink a lot of seltzer with a splash of vinegar. A splash of bitters, fruit juice, and vinegar would make an alcohol free shrub. Sometimes I'll put a teabag into a pitcher of water to make weak iced tea. This works for any tea. There are a lot of teas. Surprisingly flavorful. I often use Crystal Light- it is sugar free, comes in assorted flavors, and you can decide how much of a packet to use to adjust for sweetness. I use one of the small envelopes in 1.5 liters of water and it produces a drink that is flavored, but not overpoweringly sweet. I like drinking fruit juice - unsweetened and diluted with water. Not sure if that would be too sweet for you as I do admittedly have a sweet tooth. My go-to tricks to increase water intake without drinking water are low-cal soup for lunch (should be low salt or it defeats the purpose), gelatin desserts, cucumbers and watermelon. On the beverage front, roasted grain drink. It's a coffee substitute, very popular in Poland when I was growing up, and I really like it. I know the local brands best but I see Nestle makes one. Are you putting in enough lemon? Instead of just a slice or two, try putting in a pretty generous slug of lemon (or lime) juice. Put other stuff in your water. I like raspberries (they do fall apart and make the water pink, though). Cucumbers are good, but may be too much like plain water for you. When peaches are really ripe, they’re good, but if they’re not amazing they just don’t do anything. Mint is nice. A friend of mine grew a “chocolate-mint” plant that, no joke, tasted kind of like chocolate, and that was awesome in water. Chicory coffee or toasted barley tea / mugicha are both flavourful and generally good for you; mugicha has the advantage of tasting good cold. For the portioning, just stick to a mug with a known size and calculate a rate of consumption that'll keep you on track - e.g. if your mug is 0.4 litres and you need 2 litres throughout the day, that's 1 each with/after breakfast, lunch and dinner, and 2 others throughout the day. Or measure that jug and mark points where you should be throughout the day. i drink like gallons of rose hips/hibiscus tea both hot and cold, no sugar. it's insanely sour, just thinking about it makes my whole mouth freak out. you can buy both in bulk on amazon and just throw fistfuls in a teapot until you've got a mix that suits you. i like it so dark purple that it looks almost black in the cup. it leaves hilarious hot pink stains if you spill it on your clothes but it comes out in the laundry. Just came in to suggest roasted barley tea as well. The kind I buy at my asian supermarket comes in large packets that you're supposed to brew a liter at a time. I like to make a pitcher of it that fits in my fridge drawer and that's like, three bags at a time. You could get something like a set of four bottles where you know you should drink two of them a day, and always brew two new bottles a day and take the cold ones with you in the morning. Roasted barley tea varies a lot in taste and quality, you might try a few to find the kind you like before you give up on it. Good ones have a rich and complex flavor without being cloying or bitter, and mix nicely with all kinds of fruity and herbal flavor additions - try it with some lemon, mint, or peach slices. Another thing that might help more in general is to tweak your diet so you're having a lot of soups. Soup definitely has more flavor than a lot of typical drinks and is rarely caffeinated or sugary. I have been known to drink warmed broth when I'm cold like someone else might want a hot cocoa. Miso soup is great for this, just make dashi stock and mix it with miso in a mug. If you don't need to worry about your salt intake you could look into those fast microwaveable soups that you drink out of hand. If you have the time to make chicken stock from scratch it's always going to be delicious and surprisingly satisfying to drink without add ins, you could also make some huge batches and freeze into single portions and make sure you have one a day. Maybe Bovril, though it has salt in it. 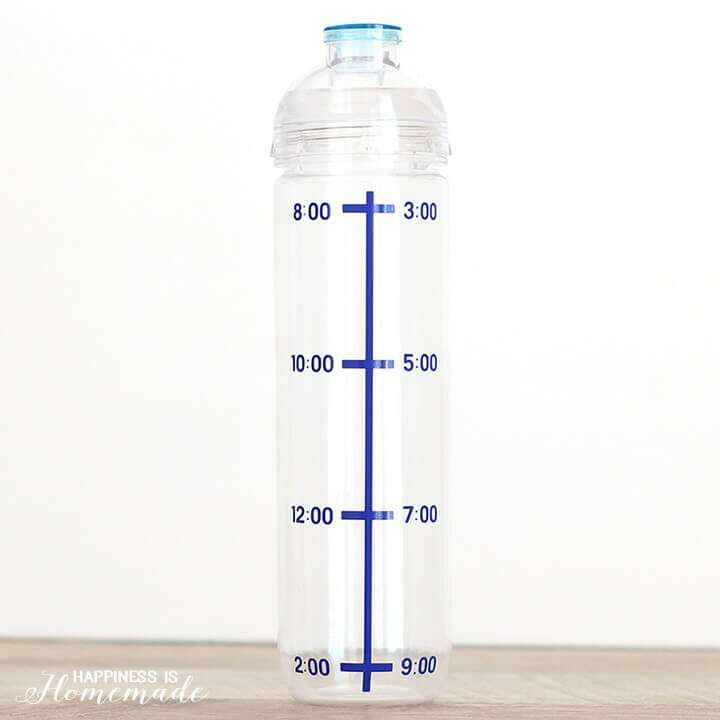 For portioning help, you could use a tracker water bottle with times on it. Fizzy water with a good few dashes of angostura bitters and a healthy squeeze of lime does it for me. You can buy hydration tablets for runners, which are calorie-free flavoured tablets you drop into water. They also have electrolytes in, which may or may not be useful for you, I guess, depending on your health condition. Some have caffeine in, so watch out for those. Easy to measure usage - it’s something like one tablet per 500ml but you can easily half them. Unsweetened almond milk, possibly vanilla flavor? There is likely variation in vitamin supplementation between brands. It has 30 calories per cup. My partner feels the same way about water with extreme intensity, and for years found it impossible to drink. Eventually she discovered that alkaline water tastes infinitely better to her, particularly a brand called Essentia. Might be worth a try. I buy tons of flavored seltzer (La Croix, Bubly, Polar, etc) off Boxed.com. Anyone who wants a $15 invite code can MeMail me. Seems like a good idea for when you’re on the go - you can keep a pitcher of something else in the fridge for home-sipping. I would recommend the Nuun brand of the hydration tablets. Delicious flavors. I quit drinking a couple of years ago, so my go-to drink at the pub (and often at home) is lime and soda. I usually have a bit of lime cordial (you can get cordial with very little sugar in it), soda water and a slice of fresh lime. I can drink it all day quite happily. It's also perfectly nice with just carbonated spring water. Cucumber water might work for you if you put a lot of cucumber in. Nthing the seltzer. Lots of people around here love Polar seltzer. If you don't have high blood pressure: liquorice root tea, both hot and cold. Pleasantly sweet but no sugar. Add ginger root for some extra bite. Take 1 liter mug. Put 1/2 inch or less of 100% blueberry juice (or other intense fruit juice from Trader Joe’s in the bottom, top with seltzer. Instead of/in addition to lemon juice, try a little lemon or orange oil in your water, it’s rather different and may fit your needs. Just a word of advice on the seltzer, if you’re really talking about getting all of your hydration this way, keep an eye out. I had switched to seltzer a couple years ago and after a while noticed a lot of, well, gas. Went back to still water and the problem went away. The easy, tasty, fizzy water on demand from my sodastream was nice, but the pain wasn’t worth it. I know you said a jug won’t work because you can’t tell if you’re making progress. I’ve seen people label their jugs with hours, like this. Cirkul has worked for me for this very issue. This is NOT the advice you're looking for, but in case it helps I'm sharing anyway. Apologies in advance. I used to really hate drinking water. I was constantly dehydrated. I also avoided juices and sodas. The only thing I could enjoy was herbal teas, hot and cold. Calorie-free, non harmful way to mask the water. This is a loaded answer in many ways but I share it because it worked. I married someone who insisted on buying 5 gallon bottles of water and drinking from those. While I thought this was an unnecessary expense, and something for *rich people*, I decided it wasn't the argument I would test our relationship on. Shockingly, I found myself suddenly drinking water frequently, and appreciating it. It turns out my sensitive taste buds didn't like the quality of tap water, but since this to me was just "water" and not "lower quality water" I thought I didn't like water. I was wrong. I'm healthier now. For two people, the costs of delivery and water runs about 25 a month and is very worth it. The large bottles are reused by the company. Oh, and I wasn't drinking straight tap before, but using a brita filter pitcher. It still made that big of a difference. If you prefer prepackaged things, this is pretty much what Spindrift is peddling. IMHO, the easiest and least-packaged option would be the "flavor enhancers" in the little squeeze bottles where you just add a few drops per glass. They come in a variety of flavors so you can mix things up, and you can dose them right into a standard drinking glass or reusable water bottle to track consumption. I use the Mio squeeze bottles (for caffeine, but they have non-caffeinated ones as well.) The flavors are definitely strong enough to not taste like water, although they do taste like sugar substitute, which I don't love. Cold-brew coffee is simple to make in big batches, and you can use decaf. Given its strong coffee flavor, it can tolerate quite a lot of dilution. It keeps for about a week, so each day you could mix up a diluted batch in a separate pitcher and vow to consume it. You could even label the pitcher in intervals to help keep on track, like marking the halfway point as "by lunch". I use dehydrated orange, grapefruit, and lime (lemon too but you mentioned that didn’t work). It comes in individual packets or shakers. Might work for you? Water tastes differently depending on the source. I assume you've always hated the flavor and have had plenty of opportunities to taste all kinds of water from bottled to well-water in various homes to city-water in various towns etc, but if not it might be worth bearing in mind. Anyway - another vote for herbal teas. As poffin boffin says, hibiscus tea is great and I find it satisfying with no sweetener at all. I like to make it really strong and add other flavorings - cinnamon sticks, a dried chili. The cinnamon brings in its own sweetness the longer it steeps. I'll heat the water, add the hibiscus and spices, then let it sit until it cools and then stick it in the fridge overnight without straining. I use either dried hibiscus flowers or any of the celestial-seasonings-type bags that are primarily flavored with hibiscus. There are a wide variety of other herbal flavors - mint, chamomile, lemon, ginger, various spice blends, etc. Often when I don't like an herbal tea initially, I find it's improved with longer steeping or by using more tea per cup of water. Agua fresca - can be a nice treat. It does have added sugar but if you're making it yourself you can control that - reduce the sugar or use an alternative sweetener. Ayran is a Turkish yogurt drink in which yogurt is blended with water. I think the version I've had might have more water than this version. It's a really nice treat in the summer. You said drinking, but popsicles and jello both give a large amount of liquid intake- you could make your own popsicles, and you could make sugar free jello, or create your own type with plain gelatin. Cold brew tea is a thing - just add your tea and let steep in the refrigerator for two hours or more. It's smoother than hot-brewed tea and obviously doesn't require the stove. I have a 32 ounce Kleen Canteen and just steep three or four teabags, screwing the lid down over the strings. By the time it's steeped, it's cold, and I can either pour it out as, eg, 8oz glasses or just figure that I'll drink 32 oz over the day. Any camping bottle would also work. This may sound silly, but minty water! I do this on road trips. 1. Unwrap one of those red and white disc peppermints. Let it slowly melt in your mouth. 2. Hold mint between teeth and cheek. Drink from giant tumbler of ice-ice-ice cold water. Let the water rush over the lingering mint flavor. Refreshing! Also works with other flavorful hard candies like cinnamon discs, lemon drops, sour candies, etc. Oh, your in Sask, Canada. Ok. Hopefully your near a Real Canadian Superstore or similar. Theyre house brand flavored sparling water is pretty good. Personally, Id just work your way though each of the flavors of the each of the brands (cheapest to most expensive, the Perrier is no better than the others) until you find one you like. If you need a bit more flavor, grab one if the Mio or other flavor-your-own-water things (usually the same aisle or nearby) and add a few drops. You want diluting juice (also known as cordial or squash in the UK) , aka 90% of my fluid intake. The fact that it's not a thing in the USA has baffled me since I found that out. You can get Robinsons online (that's just the first place I found - it's likely available elsewhere). The 1litre bottles are the regular diluting juices, the 66ml ones the super-concentrated ones; check they are the no added sugar ones. Sweetness is partly how much diluting juice to water you use, and partly the fruit - the citrus ones are less sweet. Sugar free Ribena is another good option (though googling for suppliers I find that most Americans have never tasted blackcurrant... literally, mind blown here). I also really like Teisserie sirops - the only sugar free ones I can see available in the USA are cranberry and raspberry which I haven't tried, but their 0% passionfruit or elderflower are really nice. I'm not sure I'd reccomend Vimto to anyone who isn't familiar with it - I think it's quite a pleasant flavour, but it's so unlike anything else that you might hate it. A note for comparing prices: bottled squash (like the Robinsons 1 litre) is much less concentrated than French sirops, so you will get more drinks out of a litre of sirop than a litre of squash. Ribena is a bit more concentrated than Robinsons, but less than sirops. You can make your own cordial, but unfortunately it really does need added sugar if you're making it at home. Make up your squash in one of those bottles that tracks how much you're drinking and bob's your uncle! I think at least an easy one to try and rule out if you don't like it are the grocery store brand fruity-flavored sparkling waters, every store has their own brand. They rarely run more than 99c per liter bottle (usually closer to 2/$1) and are quite strongly flavored, unlike more subtle seltzers. The MIO drops (most of them do NOT have caffeine or special vitamins, but the ones that do are marked) are also extremely handy, but because it dispenses by the squirt if you want a bit of a weak flavor you need a larger-than-single-serving container to squirt it into. But honestly anything over 16oz would do. I own an embarrassing number of Jordan's Skinny Syrups (which you can pretty reliably find at Tuesday Morning in the US, if you want to buy it in a store). Most of the ones I have are more coffee-oriented but the raspberry meyer lemon is great and I use it for frooty cocktails and Sodastream water. I'll probably pick up some of the other fruity ones as it gets closer to summer. Another vote for the convenience of flavoring packets or Mio drops. To portion, buy reuseable water bottles and fill up several days' worth at a time. I have considered getting this tracking bottle for myself because it lists specific times on it, which I think would help me. If I had a no-caffeine restriction, I'd make iced barley tea or iced spearmint/peppermint tea, but your tastes may be different of course, so i would just experiment some until you find a caffeine free tea you like. For portions, I would get some mason jars or the Canadian equivalent, and make enough iced tea to fill however many you need every day or two. If you're not transporting them, then the plastic lids that you can buy separately are much more convenient than the canning lids they come with (but they're not airtight/spill proof). I definitely think that glass jars/bottles would be better for this then any kind of plastic storage, because they'll hold up better/stain less/be easier to clean. Lemon verbena is good for this. I have a lemon verbena plant that grows SUPER fast and a big horkin' teapot (it's like a HALF GALLON of tea this thing makes). Every so often I have to prune the lemon verbena pretty aggressively, so when I do, I strip off all the leaves, chuck 'em in the pot, and fill it up with boiling water and let it steep as long as I remember. The result gets poured into a pitcher to live in the fridge. It's a subtle herby/lemony flavor that does not taste like water. I think about a quarter cup of dried lemon verbena would do you the same as my five-or-so-super-long-stalks of fresh per half-gallon. I second Nuun. A few flavors have caffeine or vitamins, so read the labels. My favorite flavors are watermelon, lemon lime and strawberry lemonade. They are not particularly sweet imo. If they're too sweet you can always dissolve them at half strength. Just want to be the Nth person to suggest the Mio flavored drink thingos. Using these was my first step in increasing my water consumption. Also I recommend La Croix (or whatever other brand you’d like) as they made my water consumption go way up. I did get a bit of a case of sass gut from drinking too much La Croix, so just watch out for that. I rather like that Sparkling Ice flavored sparkling water that comes in the tall, skinny bottles. Most of the other brands I'd tried (Pepsi's Bubly comes to mind) had a very bitter aftertaste, but these go down smooth. No sugar, no calories, etc. It does have some artificial sweeteners though (sucralose), in case that's a dealbreaker.